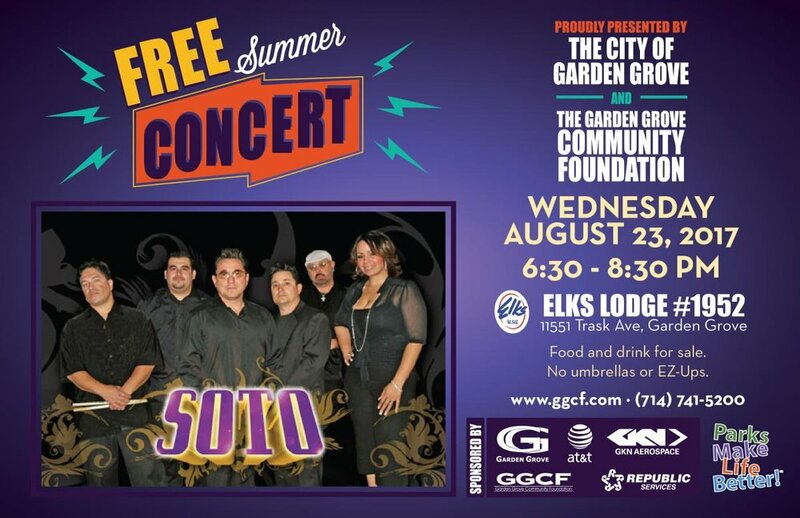 The Garden Grove Community Foundation closes out this summer’s concert series on Wednesday, August 23, with a dance party -- courtesy of R&B, Latin-Funk band, SOTO. The free concert will be held at the Garden Grove Elks Lodge #1952, located at 11551 Trask Avenue, starting at 6:30 p.m.
playing school dances and fundraisers, eventually working their way to tour with musical icons like Whitney Houston, Patti LaBelle and Marc Anthony. SOTO has performed all over the world, including the Middle East for U.S. troops, and was the first Latin American band to play in Beijing, China. When gates open at 5:00 p.m., the Garden Grove Elks Lodge will have tacos, burgers, and hot dogs for sale, along with drinks, including alcoholic beverages. For more information, please call (714) 741-5200.